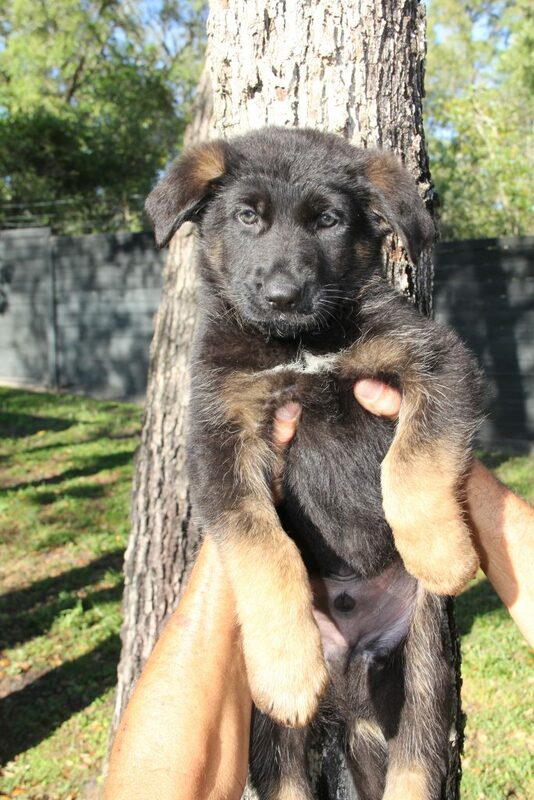 Puppies for Sale | Pendragon Acres U.S. K-9, Inc.
WE have the large sized German Shepherds here at Pendragon Acres U.S. K-9, Inc. Our Females full grown are up to 80-100lbs and our Males reach up to 120lbs. 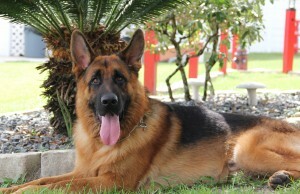 WE take pride in the appearance and health of our canines. We continuously strive to be the best. You get what you Pay for. 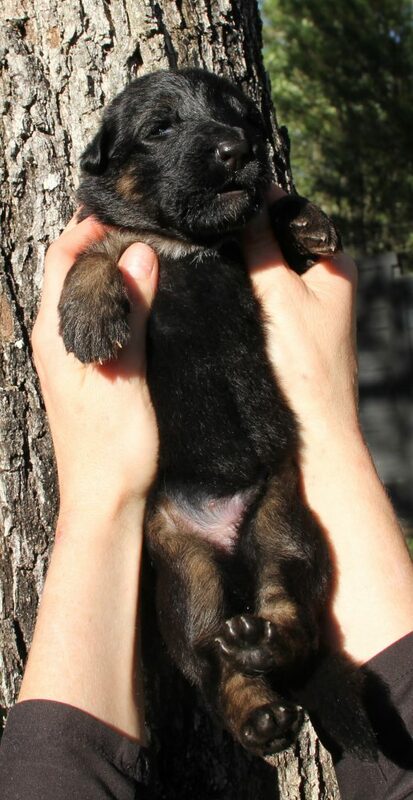 WE have been breeding and perfecting this German Shepherd Bloodline since February 2, 1932 in the family. 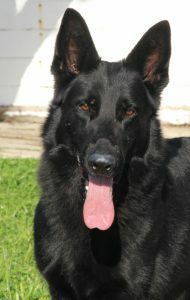 Pendragon Means ” The purest of blood.” I want a German Shepherd that makes me proud. 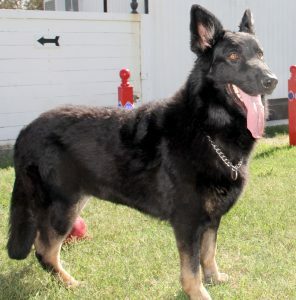 I want a Germand Shepherd that stands out from the crowd. Pendragon is Simply the Best! WE put a lot of attention and time into our puppies. WE begin feeding them DOC ROYS CANINE MILK REPLACER ($250.00/container) at 2 weeks of age, 3 times a day, along with the mothers feedings. 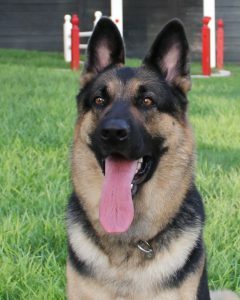 Once the canines are able to eat solid foods we also add Nuvet Lab Vitamins & Nujoint Supplements ($65.00/ each Bottle). 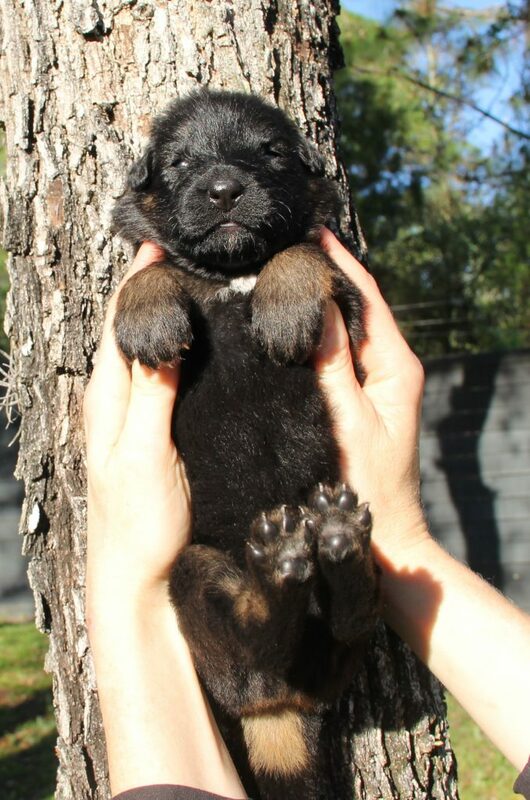 This is to assure your canine will reach full potential. We will also send you home with a strict feeding guideline so that you can continue growing your canine to its full potential. Your puppy will receive their first set of shots at 5 weeks of age, 8 weeks of age and at 12 weeks of age. Your puppy is parasite free do to our Prventive Maintenance program. We being using Pyrantal Pamoate at 1 week of age, and continue to administer a dose every week. We also bathe our puppies daily; and use sulfur dip; an anti-parasitic & antimicrobial dip. 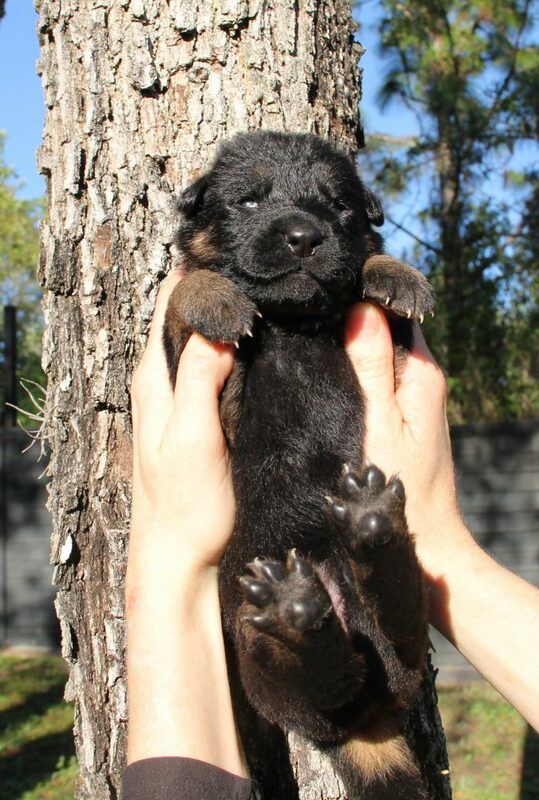 Once your puppy is 12 weeks we use Happy Jack Kennel Dip as a flea and tick preventive. Training starts from the time the pups can hear. The puppies will know beginning verbal and sign commands such as “Come”, “Back”, “In”, “Out” “off” & “Sit”. They will also be familiarized with toys. They will be introduced to a variety of noises including, hair driers, lawn equipment, vacuums, cars, gun shots, etc. 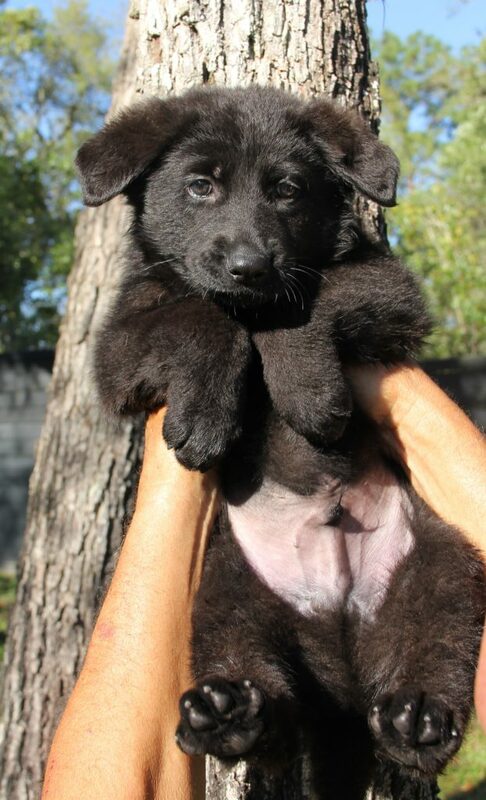 Please take a look at our puppies below & Come meet them in person!! Individual puppy viewing appointments are any day of the week 2pm, 4pm, & 6pm. Please call to reserve your time. 352-596-3414. Take a tour of our facility. Meet the breeding stock in person. We are by appointment only. Tour Appointments are Wednesday, Friday, Saturday 2pm, 4pm & 6pm. Serious clients only. Puppies can Go home Easter Weekend. Friday, April 19, 2019. 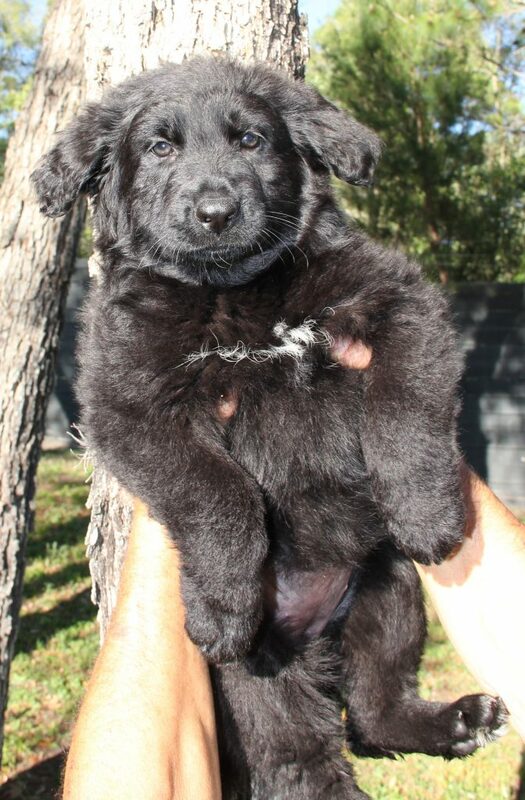 Black, Full Coat Female, $2,000 plus Tax. Microchip # 0646, SMART!! 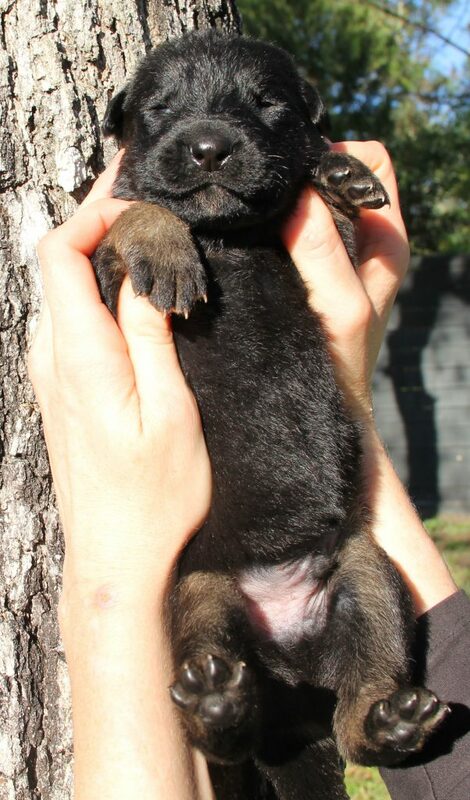 PLEASE CALL 352-596-3414 for an appointment to view puppies. 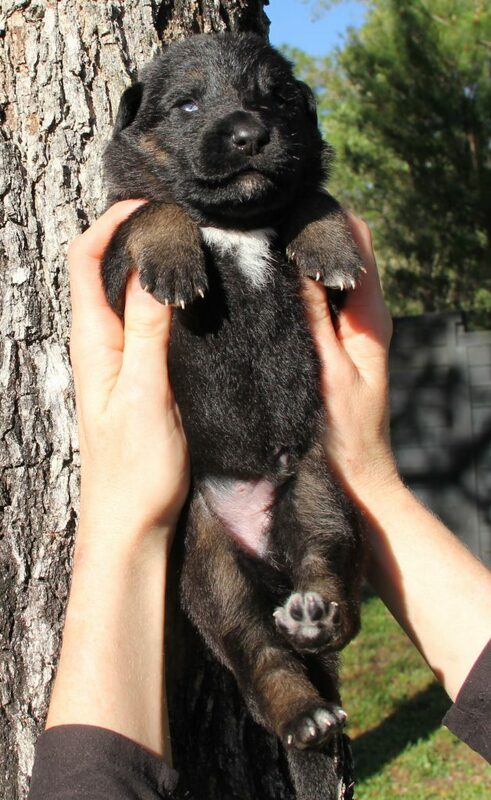 Now accepting deposits of $1,000.00 on this litter. Pick of litter puppies for this litter is $5,000.00 plus tax. 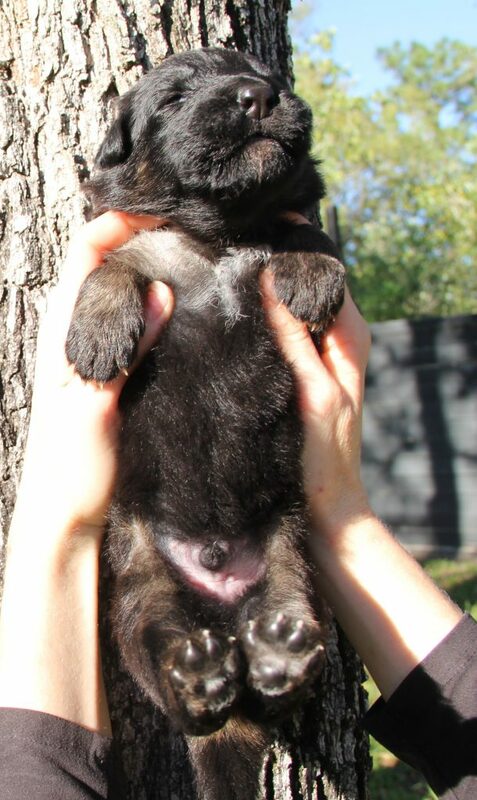 Puppy selection #3, #4, #5, #6, is $2,500 plus tax. 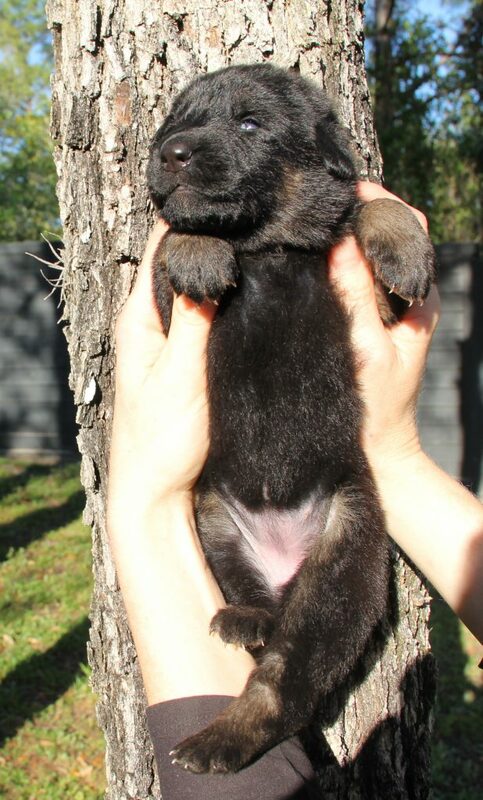 Puppy Selection #7, #8,#9, #10 are $2,000 Plus Tax. 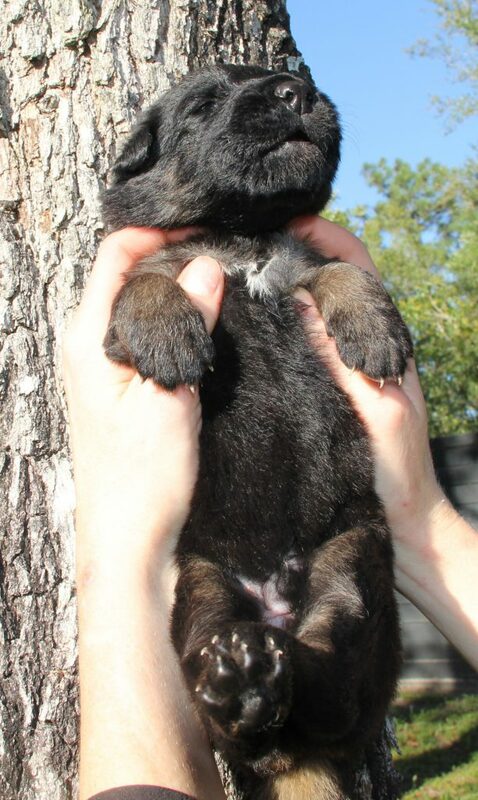 Please call now to reserve your puppy 352-596-3414. This is a proven Litter. Sound temperaments! ALL PUPPY SELECTIONS are Best of the Best. 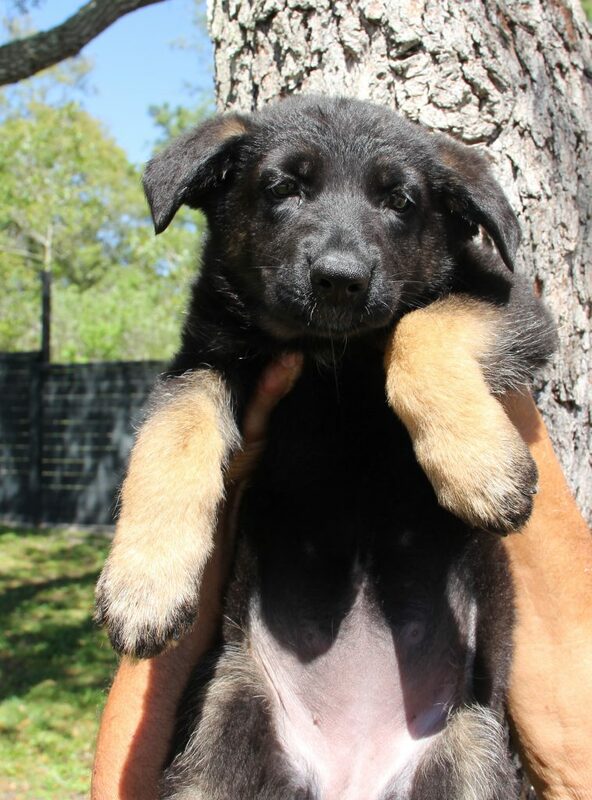 AND WE HAVE MORE!>>>> Please view our 12 to 16 week old puppies Tab on the main menu. These puppies are ready to go home. They are older, Yet very much a puppy! These puppies are ideal for persons who do not have the time or patience to grow their canine. We at Pendragon have taken the necessary time to grow these puppies to a stage ready for a home environment. please call for more information. (352) 596-3414. Also Please fill out our questionnaire on the CONTACT US page so that we can better assist you. Queen & Gunner Litter Due May 1, 2019. 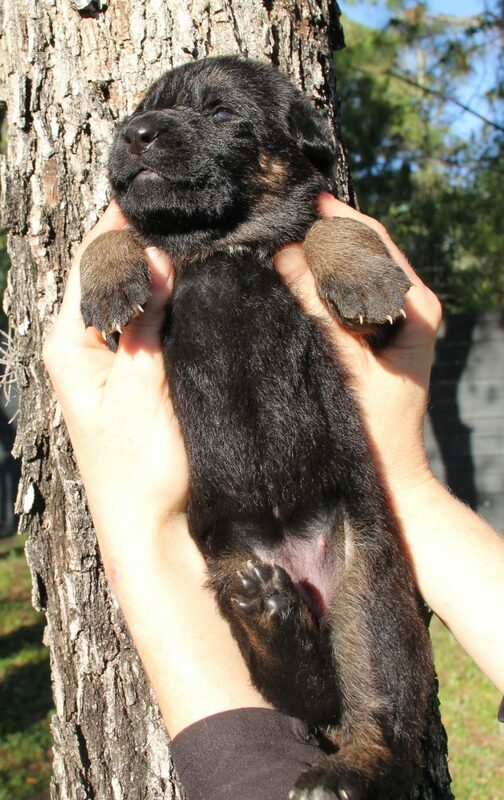 These pups can go home around July 1, 2019. These pups start @ $2,000 plus tax.